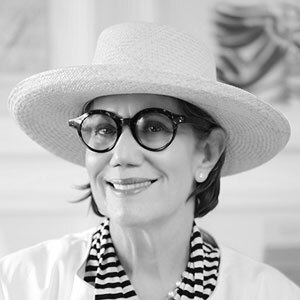 Janice Feldman, CEO of JANUS et Cie, is lauded as a true pioneer in the design industry for her impressive contributions to material innovation and superior craftsmanship since the company’s founding more than 40 years ago. A visionary and renowned business leader, Feldman, as founder and CEO, has transformed JANUS et Cie from a single showroom in the Los Angeles Pacific Design Center to a comprehensive global lifestyle brand and full-service design resource with extensive and varied collections. Feldman plays an integral role in product development at JANUS et Cie and has created numerous award-winning collections. Recent additions are Amari, Arbor, Artemis, Boxwood, Bon Vivant, Capella, Capsule, Charles, Cortino, Duo, Hoffman, Katachi, Konos, Kudo, Palmia, Panini, Relais, Sash, Slant, Suki, Triad, Vino, Whisk, Whiskey and Wing. In April 2017, Feldman received an honorary doctorate in Fine Arts from the ArtCenter College of Design. Additionally, she was named 2017’s NEWH ICON of Industry, and recently received the IIDA 2018 Titan Award.